The optical disc drive is giving out on my GoldStar 3DO machine. It’s nearly 30 years old. 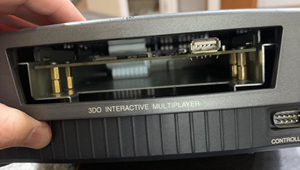 I want to make sure that the kids and I can still play our 3DO discs. I ordered this fantastic USB mod for the 3DO from a fellow out of Belarus. It came and it’s great. It includes a game/file selector app that you boot off of if you put it in the root of a FAT32 formatted USB drive. This plunged me into the hellscape that is CNET and Major Geeks download wrappers. Every useful application or utility out there is hidden on a page filled with Download Now buttons that aren’t the button you want OR if you get the app you want, it’s actually a Chrome Search hijacker. I just want to convert a damn IMG to an ISO. If you want to do this on Windows you’re going to be installing a bunch of virus-laden trial ISO cracking crap. Then I cd (change directory) into my file system where my IMG backups are. Note that my C: drive on Windows is at /mnt/c so you can see me in a folder on my Desktop here. Then just run ccd2iso. Boom. Super fast and does the job and now I’m up and running! Regardless of why you got to this blog post and needed to convert an IMG to an ISO, I hope this helps and saves you some time!